I try to be a decent writer. I try to convey complex ideas to a broader audience. I try to write in a straightforward, conversational style. But I know I often fail in this. I know I sometimes lean too heavily on technical philosophical vocabulary, hoping that the reader will be able to follow along. I know I sometimes rush to complete blog posts, never getting a chance to polish or rewrite them. Still, I strive for clarity and would like to improve. That’s why I have been keen to read Steven Pinker’s new book, The Sense of Style. 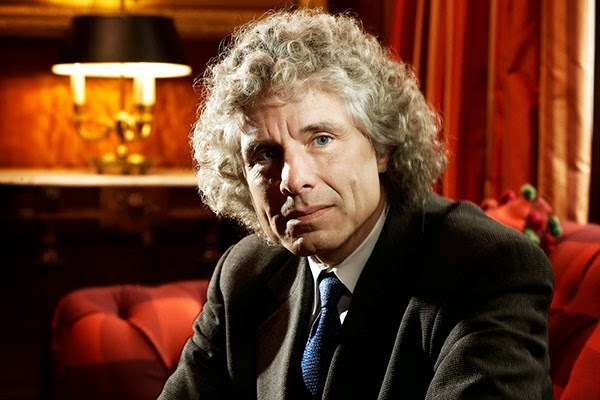 Pinker is, of course, a well-known linguist, cognitive scientist and public intellectual. And this latest book is his attempt to provide a style guide for the 21st Century. Those of you who are familiar with style guides will know the usual drill: a list of principles and dos and don’ts, often supplied without reason and subject to any number of qualifications and exceptions. Some are good, some are bad, some are merely infuriating. Pinker’s book is different. It has some of the traditional lists of dos and don’ts, but with an added helping of psychology and linguistic theory. Furthermore, it’s written in an engaging style (always encouraging in a style guide), and may be the first manual of its sort that you would actually want to read from start to finish. But I don’t intend for this post to be a fawning review. Instead, I want to share one of the key ideas from the book. In particular, I want to share the basic theory of communication that Pinker relies on, and some of his main dos and don’ts. why it is okay to occasionally break them. The guiding metaphor of classic style is seeing the world. The writer can see something that the reader has not yet noticed, and he orients the reader’s gaze so that she can see it for herself. The purpose of writing is presentation, and its motive is disinterested truth. It succeeds when it aligns with the truth, the proof of success being clarity and simplicity. The simplest example of classic style in action would be where the writer literally describes an object or event in the real world to the reader. Suppose I just witnessed an accident on my way home, and I’m trying to describe it to you in a letter. Here, the accident is the object of joint attention; the goal of the written communication is to “orient your gaze” toward that accident; and the communication succeeds when I manage to describe it accurately. But don’t get too hung up on this example. The object of joint attention need not be so mundane. It could be much more abstract. For example, it could be a scientific theory, or a philosophical concept, or an academic or scholarly debate. Indeed, I think of most academic writing as an attempt to orient the reader toward some kind of abstract “object”. In my case, it is usually an argument, one that I almost literally want the reader to be able to see: I want them to see the premises, how they connect with one another, and how they support one or more conclusions. The visual element of this metaphor is driven home by the use of argument diagrams. 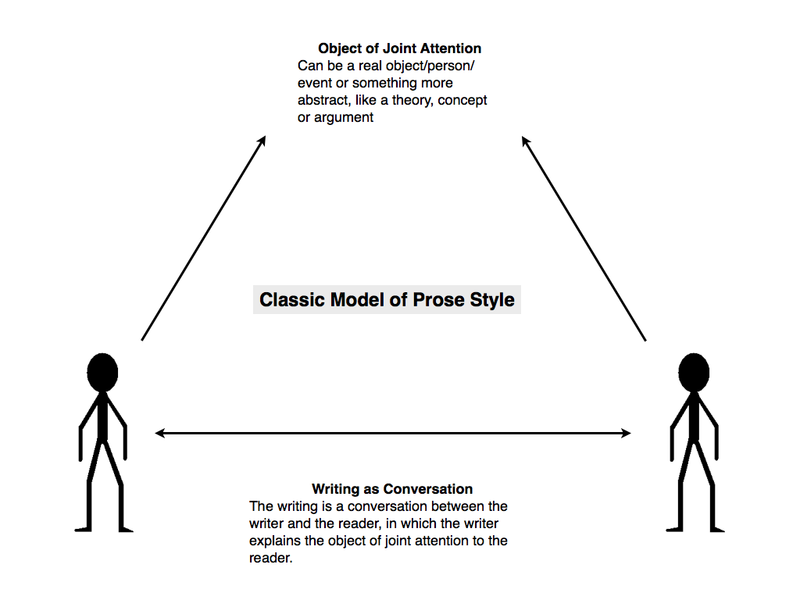 As Pinker sees it, classic style is an ideal model of communication for academic and expository writing. In academic writing, you are usually trying to explain or justify something to a reader: you have seen something they have not, and you want to bring it into the spotlight. It may be less well-suited to other disciplines. Poetry and fiction writing, for example, is not always about describing and explaining some object of joint attention (though it often is, albeit in a novel and interesting way). Classic style is the antithesis of the postmodern style. This is for good reason. Postmodernists are usually sceptical about the “Truth”. They don’t think it exists, at least not apart from the concepts and theories we use to describe it. Classic style seems naturally opposed to this since it assumes that the goal of writing is to convey some truth to the reader. However, the tension between postmodern and classic style may be more apparent than real. Postmodernists often do have important truths to convey. It is true that knowledge is sometimes socially constructed; it is true that our concepts and theories are sometimes biased. It is sometimes a good idea to draw the reader’s attention to these things. In other words, the postmodernists have no excuse. With the theory in place, Pinker proceeds to give some dos and don’ts to would-be writers. These dos and don’ts are not absolute or steadfast rules. There are exceptions to them. But these exceptions make sense in light of the underlying theory of communication. And that’s the important thing. A good classic stylist will tend to follow the rules that Pinker outlines, but they won’t always do so. This is because the good writer never loses sight of the overarching goal of communication. So long as you never lose sight of this, you too can occasionally flaunt the rules. 1. Eliminate Metadiscourse - Metadiscourse is writing about the writing. Signposting is a famous example (“in the first section we will do x”...”in this first section we will...”). Sometimes this is necessary, but it should be kept to a minimum and should be conversational in nature (“as we have just seen”... “let’s start by looking at this”). 2. Don’t confuse the subject matter of the communication with your line of work - You are trying to explain some important subject matter to the reader, don’t get bogged down in debates only relevant to those in your line of work, and don’t constantly harp on about how difficult or controversial what you are trying to say really is. This is a major problem in academic writing. For example, philosophers often talk about what other philosophers say and do, rather than about actual arguments and theories. Exception: Sometimes the object of joint attention really is what others in your field of work say, e.g. you want to talk about a debate between two famous academics. 3. Minimise Compulsive Hedging - As Pinker says, “Many writers cushion their prose with wads of fluff that imply they are not willing to stand behind what they say”. Thus we have the persistent use of the adverbial qualifiers “seemingly”, “apparently”, “nearly”, “partially”. To be sure, some of this is necessary. But it is tedious if overdone and many times readers will imply the necessary qualifications. Save the qualifications for the claims that really need to be qualified. Complementary rule: Avoid excessive use of intensifiers: they often detract from the impact of what you are saying. 4. Avoid cliches like the plague - Cliches were originally effective and punchy ways of conveying ideas - they brought to mind powerful sensory metaphors and analogies. But overuse has robbed them of this value. Try to come up with new, punchy metaphors instead. If you must resort to a cliche, don’t mix the metaphors. For example, say “fall through the cracks” rather than “fall between the cracks”. 5. By all means discuss abstract ideas, but avoid unnecessary abstract nouns - This one takes a little explaining. It’s perfectly okay to discuss abstract concepts and ideas, but you should avoid unnecessary abstraction. So avoid using verbal coffins like “issues”, “models”, “levels”, “perspectives” to convey abstract ideas. Example: “Individuals with mental health issues can become dangerous” becomes “People who are mentally ill can become dangerous”. 6. Remember: Nominalization is a dangerous weapon - This is the process of turning a verb into a noun -- e.g. affirming into affirmation. Academics and bureaucrats tend to overuse nominalizations. Not only do they strip your prose of agents and actors, they are often used to avoid accountability, e.g. the classic politician’s defence “Mistakes were made”. 7. 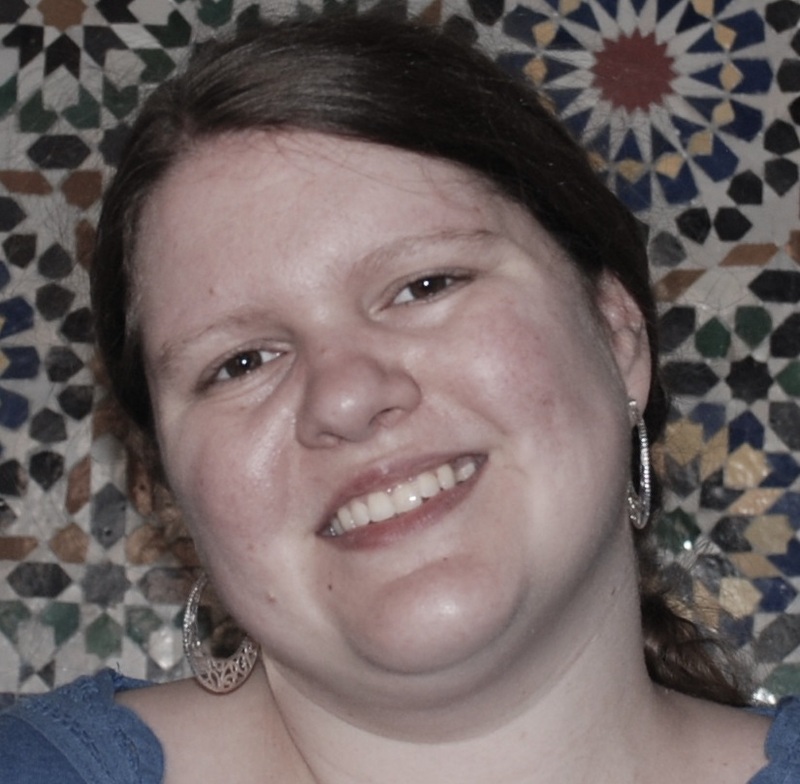 Adopt an active, conversational style - Use the first and second person pronouns, don’t talk about the article or book as though it were an agent independent of you (“this article will argue that...”). Use the active voice if possible, e.g. if you are giving important instructions to someone (Pinker gives the example of instructions for a dangerous produce: “X can result in accumulated damage over time” vs “Never do X: it can kill you in minutes”). 8. But it’s okay to use the passive voice (sometimes) - the passive voice is much maligned in writing guides, but it’s okay to use it sometimes. Just remember the guiding principle: you are trying to direct the reader’s attention to something in the world. The active voice directs their attention to the doer of the action; the passive voice directs their attention to the person or object to whom the action is being done. Sometimes it’s the latter to which you want to direct attention. For example “See that mime? He’s being pelted with zucchini by the lady with the shopping bag”. The passive construction in the second sentence makes sense because you are trying to draw the reader’s attention to the mime, not the lady pelting him with zucchinis. 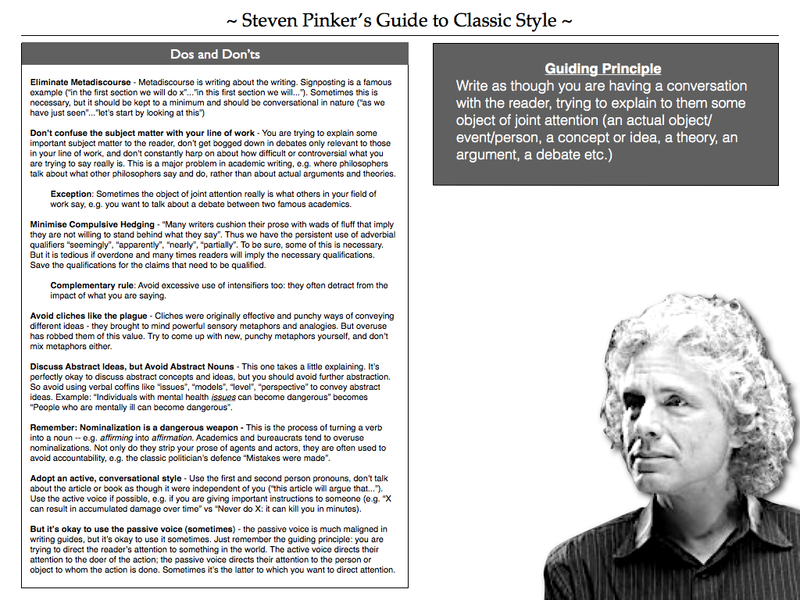 So there you have it: Steven Pinker’s guide to classic style. I don’t want you to go away with the impression that this is all there is in the book. There is much more, including some very interesting chapters on grammar and the psychology of correct usage. I would encourage everyone to read the full thing. Still, I hope this summary gives a flavour of its contents, and is of some use to all.